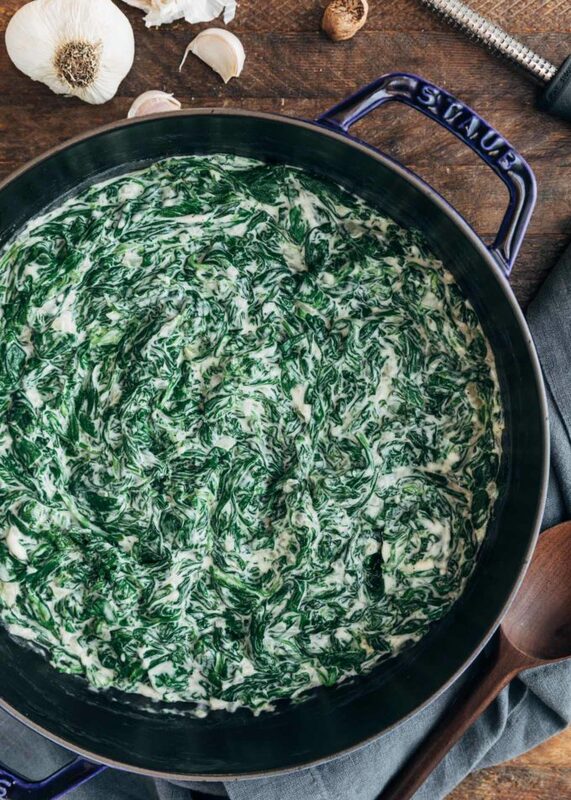 Bring a classic steakhouse dish home with this Creamed Spinach recipe. 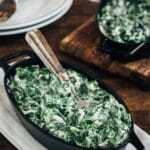 Tender spinach leaves meet a creamy, garlic-infused béchamel sauce for the perfect side to your favorite steaks, seafood, and more. I’m one of those people who goes on a side dish extravaganza when I’m having dinner at a great steakhouse. Potatoes? Check. Sautéed mushrooms? Of course. Creamed Spinach? As certain as my sizzling, rare Filet. 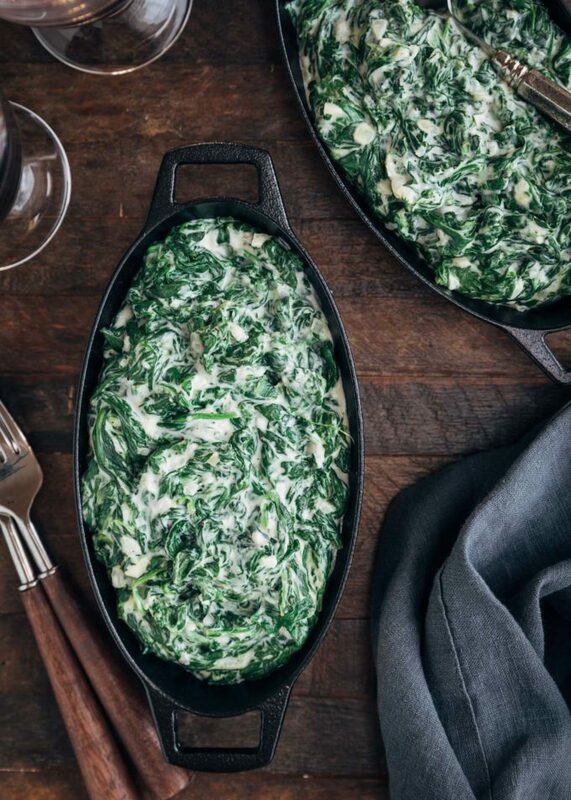 Creamed Spinach is about as classic as it gets for a steakhouse side. It’s simple, yet indulgent. Special, yet cozy and down to earth. Something you want to sink your fork into between bites of a juicy steak. 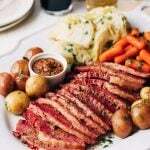 With a few tips and tricks, it’s also pretty easy to bring this essential component of the steakhouse experience to your own dinner table. 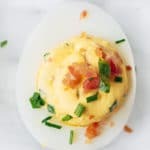 Get your serving dish ready! What Kind of Spinach Should I Use to Make Creamed Spinach? I often use baby spinach in my creamed spinach recipe. It’s very tender from leaf to stem and has a slightly sweeter flavor than mature, large-leafed spinach. Since it’s so tender, I find that I don’t have to chop baby spinach. This gives the dish a nice texture between the ribbons of spinach and the creamy sauce. 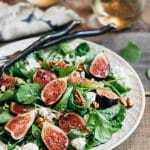 If you prefer the more uniform texture of chopped spinach, you can certainly chop your baby spinach too, after the leaves have been blanched—more on blanching below. I like to blanch my spinach for this dish. 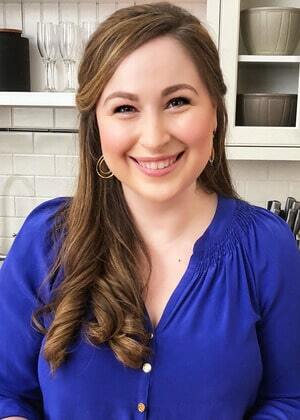 When you blanch vegetables, you cook them very briefly in boiling water and then immediately transfer them to a bowl of ice water, or run them under cold running water, to halt the cooking process. Blanched vegetables, greens in particular, are vibrantly-colored. The quick cooking process (just 30-40 seconds) brings out this gorgeous, natural coloration in the spinach. You’ll notice that when you overcook greens, the color becomes muted and dull. By shocking the spinach in an ice bath and stopping it from continuing to cook, you’re sealing in the color that the blanching produced. Important! After blanching, it is essential that you drain the spinach well. You’ll want to press or squeeze as much of the liquid out as possible so that it doesn’t release into your sauce and make the dish watery. 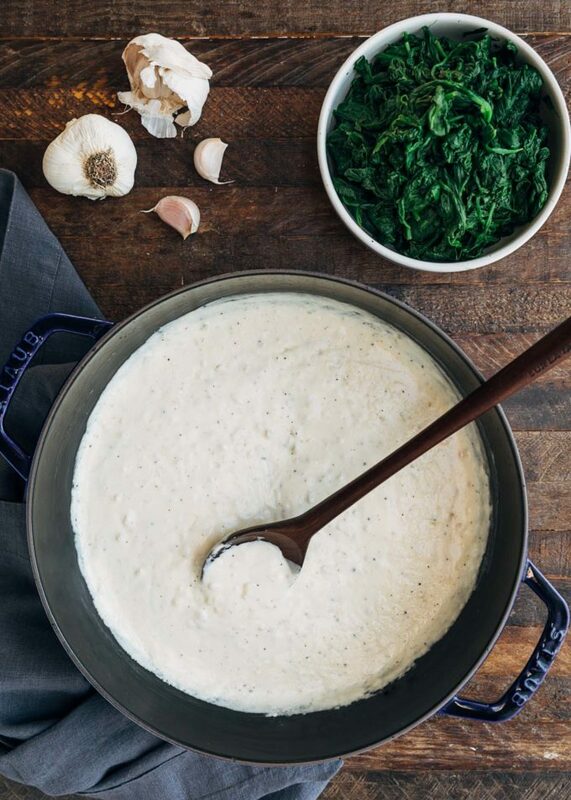 Most classic creamed spinach recipes utilize a roux-based white sauce (a béchamel), and my recipe follows suit. I’ve tried a lot of different sauce “formulas” in my quest to recreate a steakhouse-quality creamed spinach recipe at home. 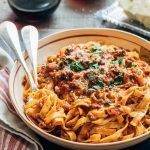 When I started the journey, I was convinced that I needed at least a proportion of heavy cream for that silky, crave-worthy texture I enjoyed in restaurants. Interestingly, I found that if I used commercial half and half, the creamed spinach sauce was exactly right. It was rich and velvety, but not “too.” If you want to make it just a bit lighter, you can also use whole milk. As is traditional, my creamed spinach recipe flavors the sauce with sautéed onions, garlic, and a little bit of nutmeg. 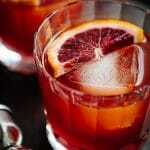 A pinch of cayenne pepper is a nice touch for a little heat in the background (or more, if you like it spicy!). 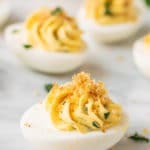 While we all know that I have quite an ongoing love affair with cheese (and some restaurants do use it in their creamed spinach offerings), I don’t usually add it to my recipe. I prefer to leave the cheese for Spinach au Gratin, and keep my creamed spinach sauce simple, creamy, and garlicky. That said, if you like a bit of cheese in your creamed spinach, Parmigiano Reggiano is a good choice. I’ve added the option in the variations section of the recipe notes. 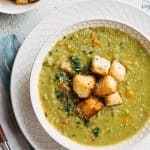 I recently tried adding toasted pine nuts to this recipe, as friend of Striped Spatula, Hugh Preece (FermentedBoss.com) suggested on Instagram, and we loved the addition. Apparently, this is how some steakhouses serve creamed spinach (and, after tasting it, I really wish the ones in my town did as well!). It’s a fantastic twist. 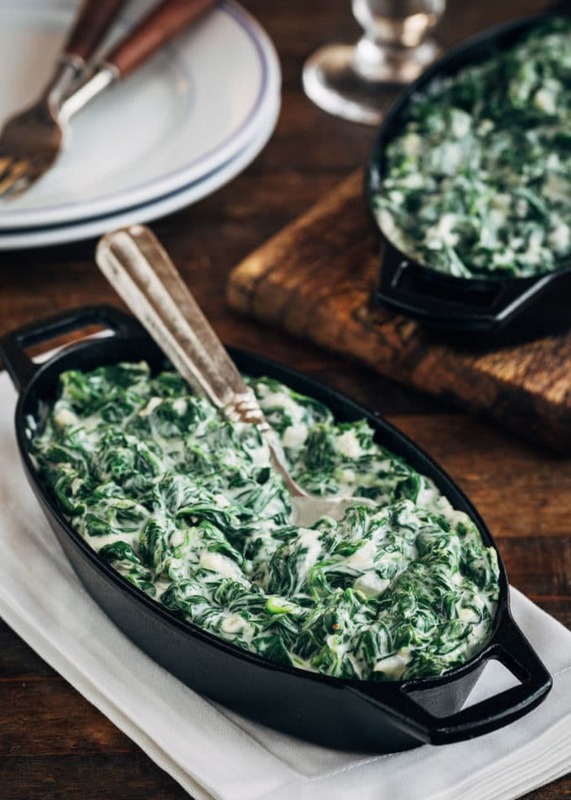 Creamed Spinach is the perfect side dish to just about any meal, from steaks, Beef Tenderloin, and Slow Roasted Prime Rib, to chicken, lamb chops, and fish. It also makes a fantastic stuffing for chicken breasts or pork chops. The sauce will start to thicken as the sauce cools, so I like to make sure that I keep it warm until we sit down to dinner. 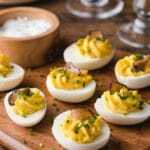 If you’ve prepped it ahead and are holding it before serving, you might have to thin the sauce out with an extra splash of milk or half and half, by eye. Creamed Spinach is a quintessential steakhouse side! See how easy it is to make this rich, delicately-flavored dish at home with fresh spinach and homemade cream sauce. Don't miss the variations in the recipe notes for customization ideas! Bring a large pot of lightly-salted water to a boil. Blanch the spinach in 2-3 batches (depending on the size of your pot), just until tender (about 30-40 seconds). 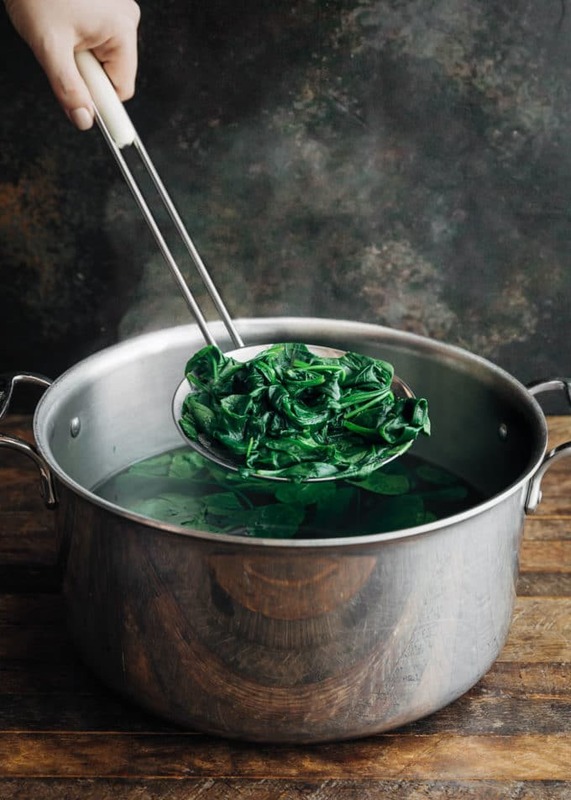 Strain the spinach leaves out of the water and immediately plunge them into a bowl of ice water to cool. Drain well and press or squeeze excess water out of the spinach in a fine mesh sieve or a clean kitchen towel. 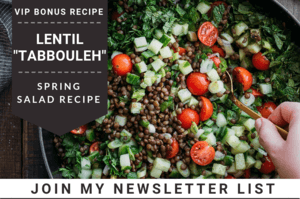 (For the creamiest spinach don't skip this step!) If desired, roughly chop the spinach. In a large pot or deep skillet, melt butter until foaming subsides. Add onions with 1/2 teaspoon kosher salt and 1/2 teaspoon pepper. Saute until onions begin to soften, about 4-5 minutes. Add garlic and cook until fragrant, about 1 minute. Stir in flour and cook, stirring, for 1 minute longer. While continuing to stir, pour half and half into the pot in a steady stream. Add an additional 1/2 teaspoon kosher salt, 1/8 teaspoon nutmeg, and cayenne pepper (if using). Bring to a boil, reduce heat, and simmer until sauce is thickened and coats the back of a spoon, 3-4 minutes. Add spinach to the pot and stir well until well combined. It takes a bit of stirring to get all of the spinach leaves evenly coated with the sauce. 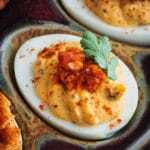 If the sauce is too thick, add a little extra milk or half and half until your desired consistency is reached. *Baby spinach has a more delicate flavor than regular/mature spinach and will yield a milder dish. 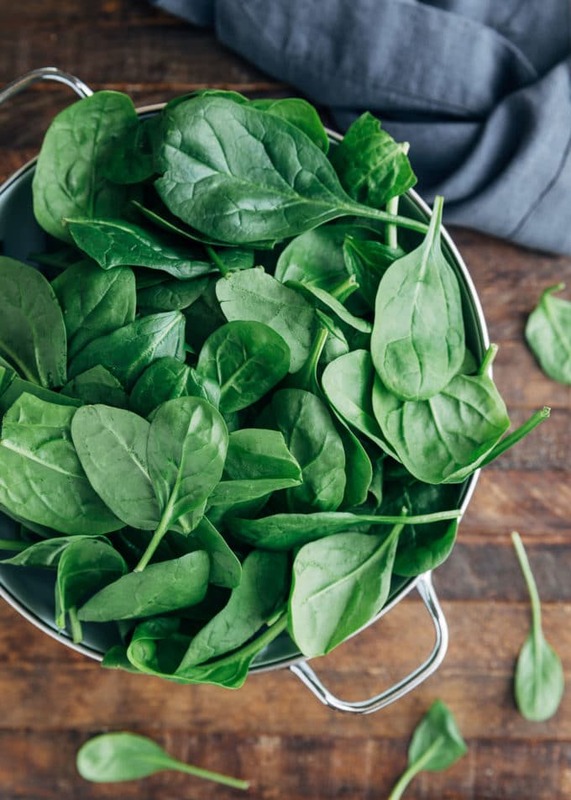 If you prefer a stronger spinach flavor, use regular spinach leaves, but make sure you clean them well and remove tough stems if buying in a bunch. Regular spinach should be chopped after blanching. 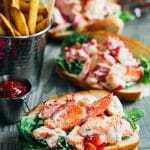 You can also substitute an equal quantity of frozen chopped spinach, cooked according to package directions and drained well. Make it Cheesy: Stir 1/2 cup grated Parmigiano Reggiano (or more, to taste) into the sauce. Keep in mind that the cheese will thicken the sauce a bit, so you might have to add a little extra milk or cream, to taste, once the spinach is incorporated. The cheese will also add salt, so adjust your salt additions to taste. Make it Smoky: Chop 4-5 slices of thick-cut bacon and start the sauce by sautéing it until crisp in your skillet or pot. Remove the bacon and all but 2 tablespoons of drippings from the pan. Add 1/4 cup unsalted butter and proceed with the recipe as written, stirring the crisped bacon back into the sauce when you add the spinach.